To those who celebrate it, happy Easter! I hope you’re having a blast making yourself sick on chocolate and participating in OneHallyu’s Easter events. To enhance the holiday atmosphere, here are ten K-Pop songs bound to brighten up your Easter weekend. Bolbbalgan4 have received a surprising amount of love and public recognition for an indie duo, and it’s certainly well deserved. The girls consistently release quality music, and mellow track “chocolate” is no exception. The acoustic ballad describes a love as sweet as chocolate, and it’s the perfect soundtrack for lazing around on Easter day. JYP girl group Twice are currently sitting pretty at the top of the K-Pop industry, and are now expanding their focus to Japan, where they’ve already found much success. “Candy Pop” is one of their Japanese releases, but it’s still completely in keeping with their signature cutesy style. The adorable anime-style music video totally compliments the song’s upbeat sound, and is sure to make you smile. Brave Entertainment’s pride and joy Kim Samuel has been pursuing solo activities since narrowly missing out on the opportunity to debut with the popular groups Seventeen and Wanna One. The sixteen year old has released three albums since August last year, including “Eye Candy,” of which the title track is “Candy.” Slight side-eye to the mildly objectifying undertones (“girl you’re my eye-candy”), but the instrumental is undeniably catchy. South Korean singer K.Will collaborated with power-vocal quartet Mamamoo in 2014 to perform “Peppermint Chocolate.” The R&B track is all about an ambiguous relationship trying to find a unique flavour, like peppermint chocolate. Due to the smooth vocals and groovy beat, “Peppermint Chocolate” is a song easy on the ears. Red Velvet have a killer discography, but “Ice Cream Cake” is arguably one of their most iconic songs to date. The song marked the arrival of new addition Yeri, and solidified the quirky musical identity of Red Velvet, who were still finding their footing at the time. “Ice Cream Cake” perfectly captures the essence of SM Entertainment’s signature sound—eccentric and experimental, yet addicting and engaging. Jellyfish Entertainment’s resident girl group Gugudan have been exceptionally clever with their comebacks, releasing title tracks conceptually based on either movies or mythology. 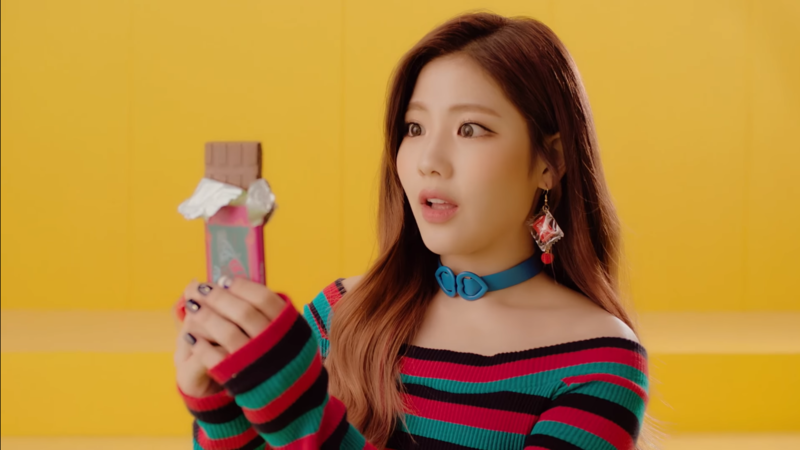 The title track of their third album “Chococo” is based on “Charlie and the Chocolate Factory.” The song is filled with references to the beloved book and film, and describes an attempt to entice a lover. Just don’t watch the music Video. Unless you want to have nightmares for a week. There, you’ve been warned. Korean-American rock band Royal Pirates typically release, well, rock music. However, guitarist and vocalist Moon Kim’s solo track “Dark Chocolate” is a refreshing deviation from this, offering a more laid-back sound. The song is an ode to a love that is bittersweet, much like dark chocolate. TOP Media’s UP10TION recently came back with all ten members following vocalist Wooshin’s hiatus. For the first time, they’re back with a full album, and the title song “Candyland” is a fast-paced dance track with sensual lyrics. The relationship depicted in “Candyland” is addictive, much like candy itself. “Chocolate” was released in 2016 by Yoon Jong Shin, and is performed by the members of Seventeen’s vocal unit. The ballad is a valentine’s confession song that reflects a very unlikely scenario in which the person that you like actually likes you back and gives you chocolate. Aw. I hope you’re indulging wholeheartedly this time of year, you deserve it! Happy Easter to all of our readers!